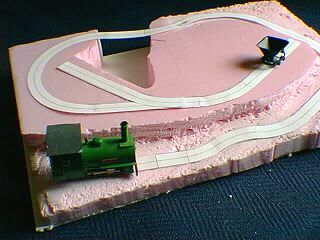 A classic micro layout is one that remains fresh and exciting for years after it’s designed. Such a layout is shown at the left. It was designed by Bernard Junk in 1991 and originally appeared in the Narrow Gauge and Industrial Railway Modelling Review. This Scrapbook page features versions of this classic layout as it’s been reinterpreted by a variety of talented modelers. 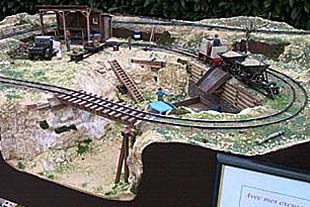 This version of M. Junk’s layout was exhbited in the 2001 Expométrique by Mario Bernkopf. It’s built to 1:22.5 (LGB) scale, representing a 20″ gauge tramway. Mario has increased the size to 120×90 cm (about 4×3 ft) to handle the large scale trains. 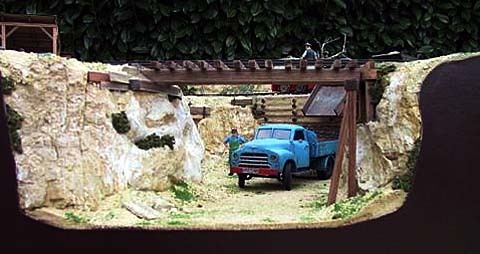 The layout depicts the terminus and truck reload of a small gravel plant in the Bavarian foothills. Notice that Mario has raised the level of the quarry rather than lowering it as in the original. And he’s added a new spur track at the left rear, which will eventually lead to the gravel crusher end of the little line. 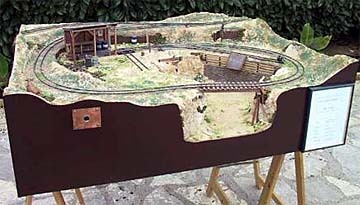 Mario’s excellent work demonstrates that a large-scale model layout with plenty of operation can be constructed in a relatively small space. And here’s an “under-construction” shot of a Junk-style layout being created by Jim Favre in Gn15. This is an early shot, with most scenery not yet glued in place. We’ll be eagerly awaiting photos of the layout as it nears completion! 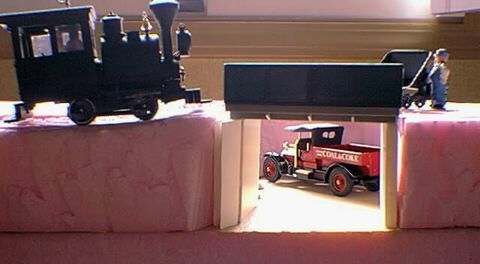 > This “under-construction” shot shows my On30 12″x18″ version of the Junk layout still in its pink-foamboard state. Track patterns are made of paper and used later as templates for laying track at the workbench. ^ In a later step, the board is covered with plaster, giving it an eerie though temporary Arctic look. 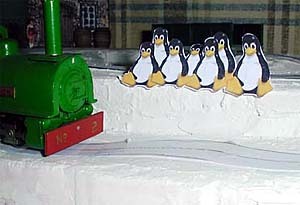 That leads to some rather strange trainspotters hanging around the layout. Not an anorak among them! In an obviously posed shot, you can see another reason why this layout design is a classic. It provides vistas and viewing angles galore for our models! And in conclusion, here’s Mario Bernkopf’s splendid version of the same shot! The Bernard Junk layout was originally designed for On2 scale and sized to fit on an A3 sheet of paper–297×420 mm (11.7″x16.5″). 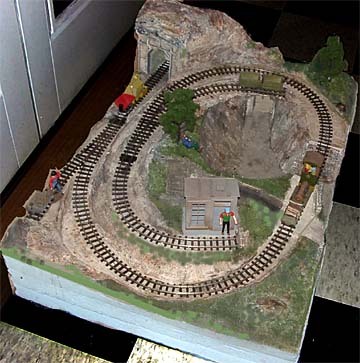 If you’d like to know more about this layout and see a larger drawing, check out our Micro Layout Design Gallery (under “Junk Sand & Gravel”). 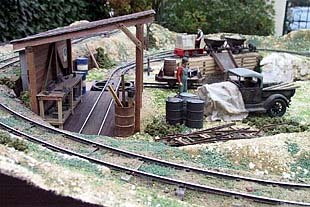 If you have some photos of your version of the Junk layout, please send them to us!